You've already done all of the hard work. You scouted apartments for months, found a roommate, passed the credit check, came up with the security deposit, managed to pack and move all of your belongings the your new digs and even managed to be at home when the cable guy finally showed up. Life should be perfect, but it's not. Why? Because your roommate is a filthy, disgusting slob. At first, you probably tried letting the mess fester until your roommate was so disgusted that he or she finally got off of the couch and cleaned up a bit. Except you always broke before your roommate did, and if you didn't clean the mess would probably have remained there forever (and probably would have given birth to other messes, too). Clearly, something needs to be done, but what should you do to fix the messy problem without causing a fight and creating an awkward living situation? If you're the kind of person who prefers to avoid confrontation, leaving a note for your roommate when he or she isn't around and then leaving for a few hours (so that he'll get home and have a chance to tidy up a bit before you'return) might be a good idea. However, if you're going to do this, make sure that you're aware of the tone of the note. Because it's hard to convey tone in a handwritten note, keep it short and simple. Something like, "Hey, a friend of mine might be coming over for dinner. Would you mind please cleaning up the dishes?" would suffice. If you keep leaving notes like this around the house whenever it gets messy (make sure none of the messes to be cleaned up are yours! 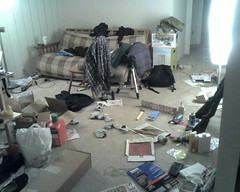 ), after awhile your roommate should get the hint and start to clean up before you have to ask. Again, it's important that you clean up after yourself before you start asking your roommate to., as nobody likes a hypocrite. When the notes don't work, or when you find yourself leaving a note every time you leave the house because your roommate doesn't seem to be catching on to what you're doing, it's time to have a talk. While you may not want to have "the cleanliness talk", it's definitely better than the passive aggressive alternatives. It's best to keep the conversation casual and to remember to avoid making accusations (however true they may be). Maybe when the two of you are in the living room watching TV, during a commercial ask your roommate if he would mind cleaning up the messes that he makes more frequently. Say something like "it's not a big deal, but the mess in the kitchen/living room/bathroom is really starting to bother me. Would you mind picking up after yourself a littler more often?" When said the right way, your roommate should get the idea and start making some changes without getting offended or defensive and making things awkward. A few dishes in the sink is nothing to start World War III over, but the habit is definitely something that should be addressed before it becomes a bigger issue. After the chat, your roommate should start making some changes. If after a few weeks he starts reverting back to his old ways, it may be time to set up a cleaning schedule that the two of you can agree to. It may sound like something you'd do at a summer sleep away camp, but it's been effective in many situations. When all else fails, grit your teeth and try to make it through the rest of your lease. Usually, the only last a year and when you move somewhere else, make sure you choose a tidier roommate.